Adding customization to our powerful XMIRXpress Lentivector System, SBI offers a linearized, ready-for-ligation version of the XMIRXpress Lentivector that does not contain coding sequence for an miRNA, so you can clone your own miRNA into the lentivector. Simply design two DNA oligos for the top and bottom strand, anneal the top and bottom oligos, and ligate directly into the XMIRXpress Cloning Lentivector. Create stable cell lines that produce exosomes carrying your miRNA-of-interest and then use those exosomes to deliver that miRNA to target cells. Don’t forget that we also have a series of pre-built XMIRXpress Lentivectors for even easier miRNA-containing exosome production. All XMIRXpress Lentivectors feature an EF1a-GFP-Puro selection cassette and a downstream H1 promoter expressing the XMIR + XMotif cassette. 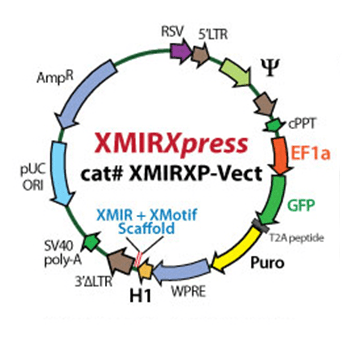 Like XMIR and AXMIR, XMIRXpress packaging relies on an RNA sequence tag—the XMotif (identified and optimized by SBI)—that targets small RNAs to exosomes for packaging. By expressing an miRNA-XMotif cassette from an H1 promoter, you can generate miRNAs that are packaged into exosomes. After creating a stable cell line with your XMIRXpress Lentivector, you can continuously isolate exosomes containing your miRNA. Exosomes isolated from cells transfected with the XMIRXpress Lentivector miR-29b only contain packaged XMIRXpress-miR-29b miRNA if the lentivector contains a functional XMotif. Figure 1. The XMotif in XMIRXpress directs miRNAs to exosomes. METHODS: The XMIRXpress-miR-29b Lentivector was transfected into HEK293 cells cultured in DMEM media with Exo-FBS (exosome-depleted FBS) in place of standard FBS to avoid contaminating bovine exosomes. HEK293 exosomes were collected after 48 hours. The exosomal RNA was purified and converted into qPCR-compatible cDNA. Relative amounts of XMIRXpress-miR-29b miRNA packaged into exosomes from the XMIRXpress-miR-29b lentivector were quantitated by qPCR with miR-16 used as a reference exosome control signal. The ΔΔCt calculation for XMIRXpress-miR-29b miRNA is shown in the bar graph.